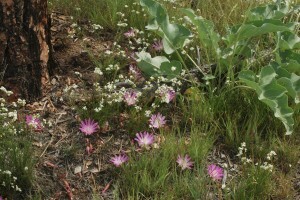 In the wild, plants are part of an ecosystem that includes insects, birds, fauna and the climatological conditions that favor a particular ‘community’ of plants. Within each community plants have established an equilibrium sharing resources including water, soil nutrients and light. Plants protect each other from dessication, provide shade for seedlings, and help attract pollinators to their neighboring plants. 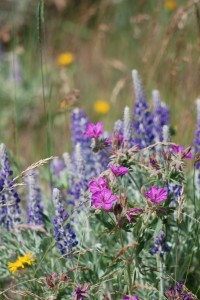 Within a habitat the natural succession of plant bloom times often provides pollinators with food for periods that extend beyond the bloom time of individual species. A successful garden or landscape often replicates these community types and attempts to group together plants that grow in similar habitats. Doing so creates a balance in which no one plant overruns another, all plants are able to thrive, and there is a natural succession of bloom times. Look at local native plant communities on sites similar to yours as a model of the plant communities that will work for your site. Survey these plant communities several times during the year will provide good idea of the many plant species that exist in your ecosytem.